The Barometer profile shows the current sea level air pressure. This is based on the reference values given and the constantly measured absolute air pressure. Changes in sea level air pressure are presented graphically in the middle of the display. The display shows the recording of the last 24 hours with a recording interval of 30 minutes. 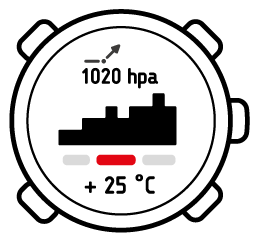 When the Barometer profile is activated, the word Baro is underlined on the display. If you are wearing your Suunto Core on your wrist, you will need to take it off in order to get an accurate temperature reading because your body temperature will affect the initial reading. A 7-day log of changes in sea level air pressure can be viewed in alti-baro memory in Menu (see Alti-baro memory). You’re still hiking and you’re getting tired. You decide to take a nap and you set up your tent. Since your altitude will stay the same for a while, you activate the BarometerBarometer profile. When you wake up, you will be able to check changes in sea level air pressure with an eye on the weather. When you are recording logs in the altimeter profile, you can switch to the Barometer profile when you for example take a break during a hike. The log recorder will continue recording the log, but it will not record changes in air pressure. When the barometer profile is activated, the device assumes you are not moving in altitude, and it will therefore not record any altitude changes. The altitude log will therefore be flat during this period. For information on using the log recorder, see Recording logs. You can start, stop and reset the altitude measurement while in the Barometer profile. You are recording your altitude changes during a hike and decide to take a longer break. You switch to the BarometerBarometer profile. Since the altitude recording continues but no altitude changes are occurring, you go to the log recorder view in the BarometerBarometer profile and stop the altitude recording.